Roland is caught on camera Rapping with Da Crew. 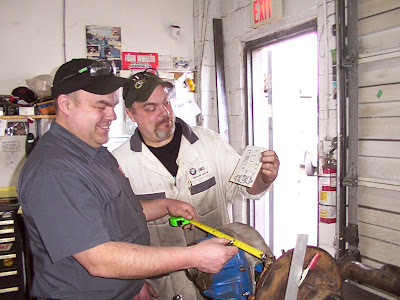 All that training is being put to the test while operating the intermittent main racecar adjuster tool da knockometer. Today we welcomed a new team member Roland Anderson. 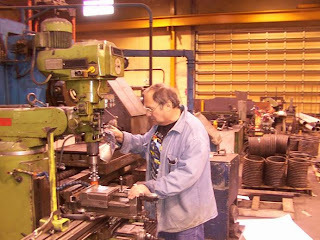 Roland joined Aggressive Tube Bending early this year and is a journeyman millwright/ machine builder. 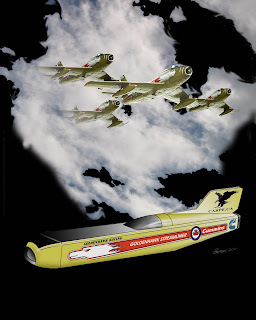 The former Ontario resident was originally from South Africa and learned his trade at Blow press Ltd. and Ontario Die Company and is also donating his time to build the Goldenhawk. He has a large capacity for good ideas to design certain parts in detail very quickly. Welcome aboard Roland! 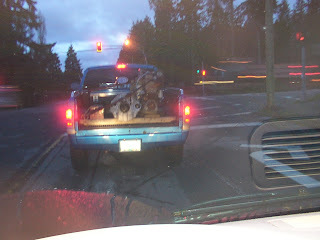 It was just breaking daylight when Werner left for Aggressive Tube Bending in Surrey. In the back of "ThunderTruck" was the little Cummins and the heavy duty diesel Dodge 4 speed automatic transmission. When we arrived at the shop, Yuri and Kevin were waiting to get started. By the time we got ready to unload the power train, Andrey and (new guy) Roland were geared up and ready to roll. Kevin was right on top of the laptop checking measurements and design drawing that he made working very late last night. 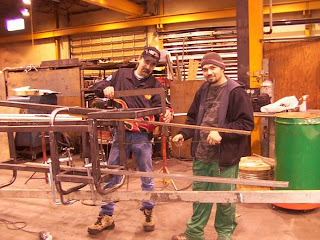 Andrey was welding as usual and Roland was helping Werner get the front drive in place. Yuri and I got steel down from the racks and he cut several lengths for the power frame. The engine was attached to the transmission and then set in to position in the chassis to make final checks and prove the draws were correct (as usual with Kevin, he is always thinking ahead). He is now working on the Canopy hinges and dash board. It was a very productive day thanks to the hard work and dedication of the team. Thanks guys! Well the Murphy's law is rearing its little head. The drive axle and the steering are just a lil bit wider than we anticipated at the beginning of the project in the design stage. Therefore the frontal area is increasing to allow for the tire clearance in a turn. 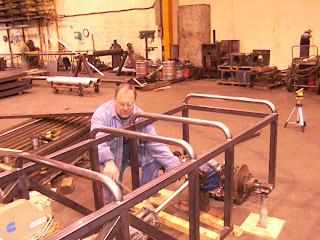 The workmanship of Ben and Chris Olson of OTT Ind. 's is superb and the drive will be bullet proof (even with more motors). Today at Aggressive Tube Bending Yuri, Adrian, Andre, Werner, Roland and myself were busy with drawings designs and mock ups to double check everything for clearances before we fabricate the power train frame. 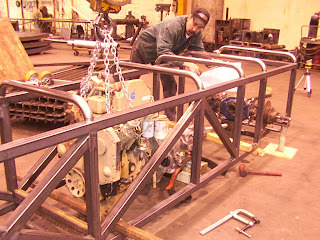 Tomorrow we will set the engine and transmission in the chassis to mock up the drive line. 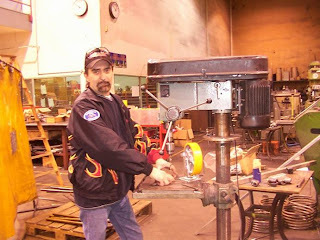 Paul is coming from Hydra Steer and will begin to design of the final steering assembly. see you at 7 am. Thanks to all the people giving up their time to make this project a reality. 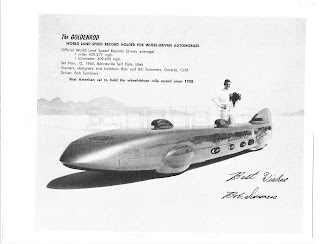 Many thanks to Mr.J.John Veenstra for mailing me two large envelopes full of photos and articles about the Summers brothers cars, the Polywog and the Goldenrod. It seems that John owned a farm next to the shop where the brothers built their stream liners and used to travel to the Salt Flats with them to help out and watch them run. He says they were very talented and respectful of the neighbours. John says that on the first runs of the polywog it suffered wheel bearing failure and that one of the supporters became overwhelmed and wept. (I hope we don't have need to weep). John enclosed a full set of drawings for the Goldenrod as well as the photos of the original design in scale models which show the intended shape changed to suit reality when it comes to building things. 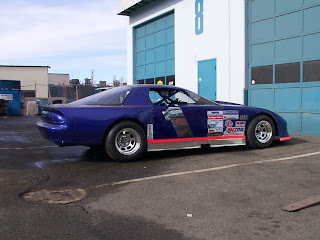 John moved to Idaho many years ago and took up driving dirt track modified with much success. 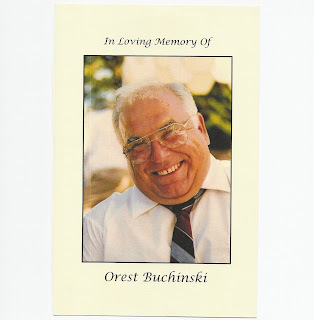 A talent he passed along to his son, Super modified racer Rick Veenstra. This is for all you who ask "Are you running biodiesel"? The answer is no it smells like food and I'm over weight! But also underfunded so maybe if the right deal is presented the Hawk may be smelling yummy! While driving in Pennsylvania, a family caught up to an Amish horse drawn carriage. The owner of the carriage obviously had a sense of humor, because attached to the back of the carriage was a hand printed sign... "Energy efficient vehicle: Runs on oats and grass. Caution: Do not step in exhaust." Check out this article from Peterson's 4 Wheel & Off road magazine, it is in the April issue and features Chris and Ben Olson's (OTT INDUSTRIES) custom diesel powered jeep. 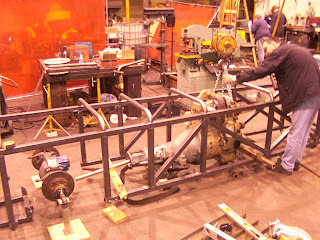 Good news the front drive assembly that OTT INDUSTRIES supplied will fit although it will take a little tweaking of the chassis. yes now we know why the Summers brothers Goldenrod had the little bulges over the drive hubs. 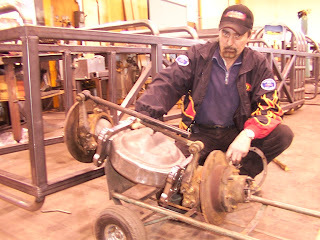 Werner is busy setting up the adjustable jig for the fabrication of the drive into the power train frame. I'm happy to be back at it. Today I met with a fire suppression company, they are very well known and quite professional in their approach to the task. We may be able to announce them as a sponsor soon. 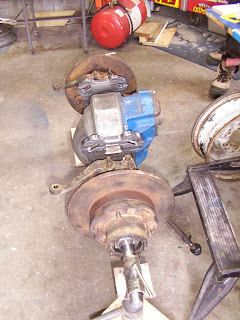 Well in true race car fashion Ben Olson of OTT Industries worked not only all day Saturday but into the night to complete the front drive/steering differential. He delivered it to Werner's pick up this afternoon for transport to Aggressive Tube bending tomorrow. The project is back on track! Watch for things to happen now. 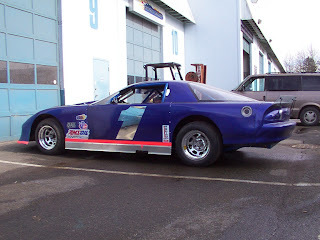 Thanks for the great dedication to the project, it seems that no matter how far ahead we plan when you build a race car it is always the last minute crunches that pay off. 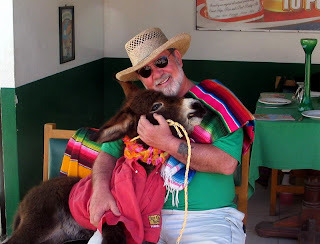 I am very pleased to tell you that Brian is pretty much back to normal after the install of the pacemaker. Pat served a great dinner ("The last supper" before they redo their floors) for Wendy, Carole & Steve, Brian and me last night. The stories were flying and Brian told tales of trips to Spain & Mexico that kept us in stitches for the entire evening. We will look forward to his photography of the project in the coming days. 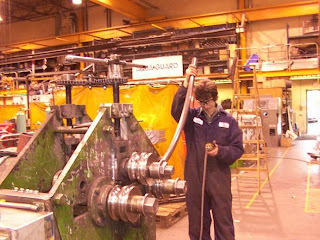 The Estimated Time for Arrival of the front drive differential from OTT INDUSTRIES is Friday, so St. Patrick's Day volunteers will be able to begin on the fabrication of the POWERTRAIN FRAME. When it is built the car will be moved to the next stage which is fitting the engine,transmission and the overdrive plus the lift rams. And lets not forget the tanks and interior and all the electronics. Yesterday after his work day was complete at Aggressive Tube Bending, Adrian stayed over for quite some time while we discussed the changes to be made to the tail of the car so that the chute/ blunt end is smaller. Adrian worked his magic with the Cad computer and determined by extending the tail 29 inches we would be at the desired size 221/32 high. He also will change the push bar to a single 2" tube instead of the loop we previously designed. This will reduce the turbulence of the air at that point (hopefully). The Beautiful machined attachments (thanks to Aggressive again) have been installed and now the whole tail can be removed for ease of handling and storage. 4 drafts of plan makes for a change! 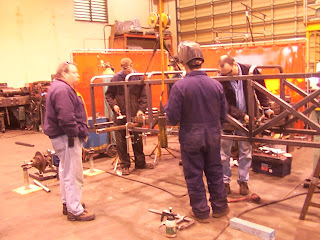 10 March 2007 the chassis is almost ready to go to the next phase. 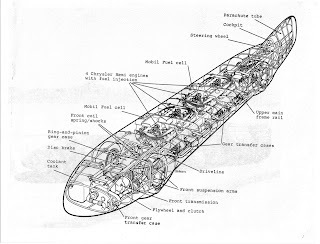 Then we noticed the tail section was rather large, so we went back to the original drawings and guess what? Yes it is to0 large ! It would seem that the drawings varied from inside measurements to centre line measurement as they were changed from one type of format to the next. Perhaps we should have checked that detail as per our overall plan but, Oops! The fix is simple make the car longer so that the tail is carried on to the planned dimensions where the chutes are located. This will mean changing the length too maintain the 7 degree angles by 16.5". That will make the car a little over 28'6" and increase the lateral stability. pictured is Werner And Andrey mocking up the changes. We are still deciding whether to use Tube chutes or drop chutes to stop the car. 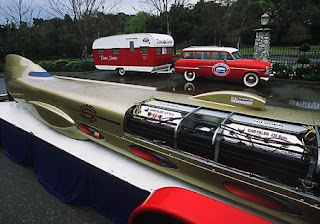 A lot of knowledgeable folks in the Land speed community have suggested launching from the tubes is best and some say dropping is OK with the small tail of the car. I am accustom to dropping the chutes on the dragsters and like that the chute is out in the air immediately on release. I am going to talk to the manufacturer, but I am leaning toward mechanical launched tube chutes. Thanks to Sean for helping today & Andrey who also is donating his day off tomorrow to caught up to schedule. Even caught Tom Sawyer working! Randy was learning how to make Coping joints for the bracing. 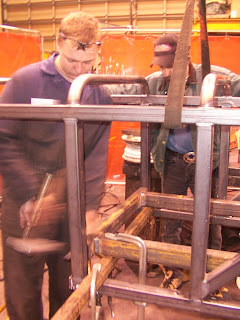 Werner was busy making mounts for the casters to move the chassis around the shop. These will be removable and can be installed any time to work on or store the car. Thanks to Princess Auto and Rich the Langley Store manager for the Donation of the parts. At OTT today Ben and Chris Olson (no kidding they are the real Olson twins) were preparing the differential and hubs for the Front wheel drive unit. They were taking time out from the heavy work load they have that comes for expert manufacturing heavy duty steering and gearing for the Off road enthusiasts from literally all over the world. we as a team are grateful for the expertise they bring to the project and their attention to all the details. With only 5 months and 4 days to be at tech inspection with a new car, time is very critical. However, I wanted you to see the drawings that they are working from, note a piece of card board with a pencil sketch. They simple apply their skills and punch in some numbers on computerized equipment that they customized and "Voila!" precision! You are enabling us to make the deadlines with "our dollar ninety eight Canadian". We are most thankful for the sponsorship and talents of Dave Coombes, owner of KOOL COAT in Port Kells, BC. 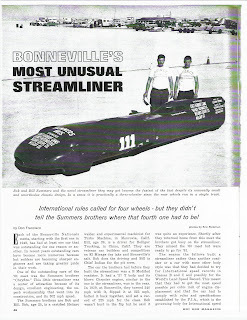 This is one of the first FWD streamliners. It was Summer's Bros. (photo from internet) 1963 entry I think. The top one had 4 Chrysler hemis and went well over 400mph. and held the record for decades it is called the Goldenrod and is presently being restored. 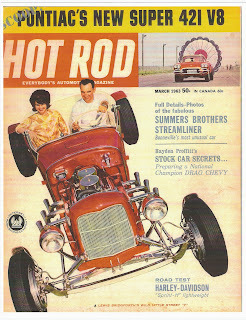 i would like more pictures of this one and I'd love a copy of the HOT ROD Magazine coverage. Anybody got it? There is a copy of the news report that you can see on your computer. It is a rather large file almost 5 megabytes so phone downloads take a little while. Many Thanks to Yuri Tofini of Aggressive Tube Bending for sending it to me. Yuri is planning to drive the car as soon as I have tested and hopefully set the E/DS record at over 200 mph. 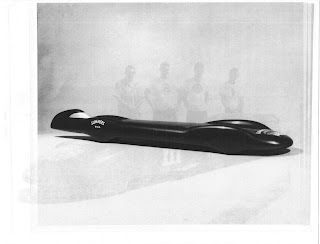 In the beginning the plan was to put a VW 1.9 TDI in my old warrior (the War Baby) dragster chassis and Andrew Kerr very kindly designed a body profile for it. Then I discovered that I could put in two engine and run one class with one hooked up and another class with both connected. Great idea as two engines would be in an open class and pretty much guaranteed us a record! So I added a tail to Andrews design and began to contact VW as a sponsor. Well entering into a corporate that has been bought by another company does not make for a good chance to find someone with the authority and vision to say YES. The I spoke to a young man who is experienced with High Performance diesels on the dyno and he suggested I find a Cummins BT 3.9L . A call to Cummins Western Canada lead to a tired core and the rest is still developing. 1 engine - 4litre -front wheel drive . ACME FIRE & SAFETY CO.LTD.